THERE'S NOTHING LIKE A FAST BIRTHDAY! Looking for a unique and fun way to celebrate your child’s birthday? Celebrate the FAST way with one of our action-packed options that will be sure to leave your guests sweaty and smiling! Our team of enthusiastic and energetic coaches will make sure that your child remembers his/her FAST birthday party for years to come! FAST birthday parties are typically structured to be 1.5 hours. For the first hour your guests will participate in a variety of fun sports/games/contests (see below for some ideas). For the last half hour, we’ll shift our facility into a party space where we serve pizza, refreshments and birthday cake! 60 minutes of FAST activities - see below for party ideas! "at home" or outdoor parties available too! Let us bring the FAST fun to you! Whether in your backyard, local park, or event space rental, we can set-up a customized FAST party anywhere you want! Let us know what you have in mind and we can create the ultimate party experience for everyone with our team of FAST coaches leading the way. Birthday “Boot-Camp” – you give us a theme (basketball, soccer, fitness, dance party, etc.) and we will design an awesome program filled with mini-contests, fun challenges, and unique games that will have all of your guests moving and grooving in no time! Birthday “Color War” – every child loves camp, and what better way to celebrate a birthday than with your very own Birthday “Color War”! You give us a theme and we will design an unforgettable program with teams, events, judges, scoring, cheers and much more. Birthday “Hall of Fame” – what young athlete doesn’t love trying to set records? 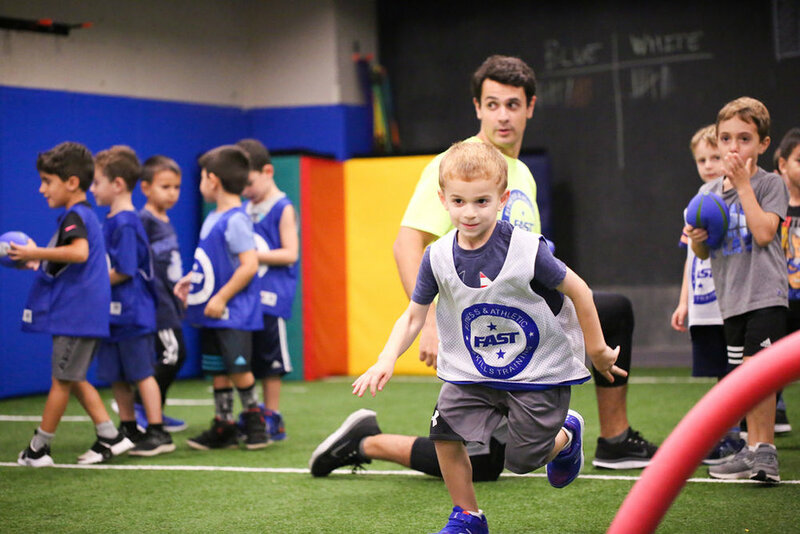 Our Birthday “Hall of Fame” program gives children the chance to participate in a variety of sports games and challenges to set their personal and team records. Whether it’s a 3 point shoot-out, slam dunk contest, football accuracy, baseball home-run derby, or much more, children can’t wait to create their own record book! Birthday "Olympics" - let us know what your child loves to play and we can design a multi-activity, multi-team competition that will be non-stop games, challenges, contests and spirited fun! PLEASE FEEL FREE TO FILL OUT THE FORM BELOW AND ONE OF OUR BIRTHDAY PARTY SPECIALISTS WILL BE IN TOUCH!